Avalon*Oceanview* Split-level*Upper Level *Pool and Jacuzzi*. (Newly purchased: To review our 7 year 'review' history, please see 360 CLEMENTE B45 (#308563) REVIEWS.) We are pleased to offer our golf cart for your use if the terms and conditions are met. Just above the Rooftops of Santa Catalina's Quaint Little City of Avalon is 'nestled' this Tri-Level Upper-Level Suite just steps (about a half-city block) from the Boardwalk and sandy beaches. Upon your return from a fun-filled day, a refreshing Swim awaits you, as we are pleased to offer one of the few Pools and Spas on Catalina... Back up at the Suite .. Breathtaking Harbor, City, and Hillside Views from all 2 Private Balconies keep reminding one of Santa Catalina's beauty and the state-of-mind revealed in the 'Island' lifestyle. Yes, this is a vacation, and the 'Island' awaits one with activities such as golfing, tennis, scuba diving, fishing, hiking, para-sailing, miniature golfing, glass-bottom boat rides, shopping, fine restaurants, and so much more. The Chicago Cubs used to have 'Spring Training' in Avalon back in the 50's and 60's; and one can learn and read much of this treasured history by visiting the Casino museum, and the Country Club Restaurant adjacent to the golf course, which features numerous photographs of prior year 'boys of summer'. 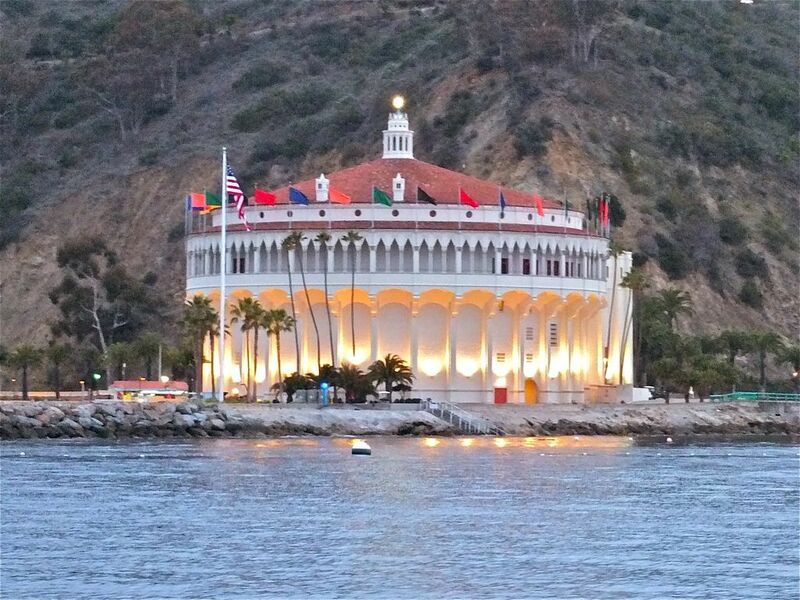 And finally, make some beautiful history of your own in the little island paradise here on Santa Catalina Island just a short 1-hour boat cruise from the coast of California's Long Beach, San Pedro, and Dana Point. It's your call. Thank you. NOTE: There is a two-night minimum stay for weekends due to a high volume of inquiries. We appreciate your understanding! We are a family always looking for that 'perfect' vacation experience', and we believe --although perfect can be evasive--the Catalina experience comes close. From your harbor arrival in this quaint little village of Avalon, the endless charm and activity, becomes enchanting! Come experience the Catalina for yourselves: You will be happy you did! Growing up in Southern California and Sailing to Catalina as a child on numerous occasions attracted us to Catalina in the early days, and our memories have brought us back. Many times our fathers would sail over, and we kids would come across the channel on the old 'Steamship'. I will never forget the local kids (some younger) swimming out to meet the Steamer and then diving deep for coins/money tossed from the upper decks from the visiting passengers. Those days are past, but a new adventure is always just a step or thought away in this island paradise. In addition to gorgeous harbor views, we are also uniquely situated above and away from the 'sounds' of busy little golf-cart traffic that sometimes can disturb a peaceful evening. We are located at the SE corner of the flats in the quaint 'village' of Avalon ... We are essentially 2 blocks from town. Catalina has a public golf course. Gorgeous Ocean and Harbor Views from both levels and both decks! We were really impressed with our stay in this beautiful remodeled home! The kitchen was fully equipped and the electric grill was excellent! The 2 bedrooms upstairs were spacious and the beds were very comfortable. The home also came with a full size washer and dryer which made us feel at home. The owner stopped by to ensure we had everything we needed and she even threw in the golf cart during our stay. The golf cart helped our way around town to capture the great scenic view. We would definitely stay here again on our next visit to Catalina Island. The location is fantastic! Walking distance to the many shops and restaurants Avalon has to offer, yet off the main drag, offering a quiet, relaxing location to retreat after a long day on the town and in the water. The view is beautiful...nothing like starting your morning with a cup of coffee on the patio and ending the evening with a glass of wine while taking in the breathtaking view. All the comforts of home; a fully stocked kitchen of appliances and to our surprise a nice variety of spices, coffee, etc. The linens and towels were much nicer than I expect to have at a short-term rental. Kim was great to work with and her follow up very prompt. We will stay here in the future and highly recommend it to others. Love the view from the Condo ! We really enjoyed our stay at this beautiful Condo with fabulous view of the Island. Our stay was short, but worth the trip to this Super fun Island Oasis. Kim did a great job setting us for the stay and very responsive when we asked about this and that. Highly recommend this Condo and Avalon at Catalina Island. Great experience for the Southern California feel. I stayed here with me and a group of 3 friends for a girls vacation. I was beyond happy with this condo. Short walk from the boardwalk. Hosts were very accommodating. Thank you again! I had the fortunate opportunity to stay at this condo during my vacation with my family to Catalina Island. I felt very at home and comfortable. The host, Kim, was phenomenal, to say the least! She made our stay very enjoyable. When I come back to the island, I won't be staying any other place other than Kim's place. Thank you for everything!